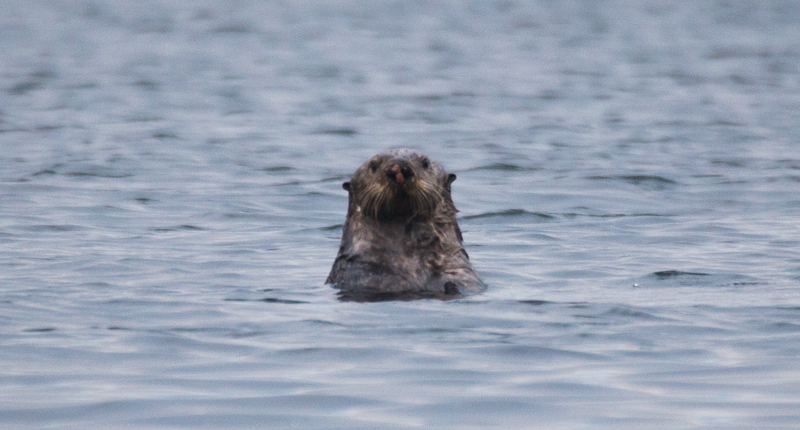 As you remember,yesterday I found the carcass of a Sea Otter. I towed it to shore & tied it to a tree so it wouldn’t float away. I had decided to travel all the way down the inlet to grab my trail camera.I was going to set it up looking at the carcass in hopes of some wolves coming over for dinner? Well……….they did, but they started without me! When I came into Tsapee Narrows I found both the Daredevil & Delilah on the carcass. I thought I’d go to shore & check it out? I found it had all been eaten! I was very disappointed! A pack of wolves must of come through during the night. They ate the whole thing & even took the head! Must be those head hunting wolves. So much for my plan! I believe that this is an adult female?How do I know that? ….the nose. The reason why that nose is pink is because of scar tissue.The males usually grab the females neck to make her stay put while he mates with her but they also grab the nose as well.The nose is very sensitive! She doesn’t stay still & so the nose is damaged. I came across “Lilly” swimming through the harbour.She was heading westward & I was heading eastward. She seemed approachable. I noticed her nose was recently injured! 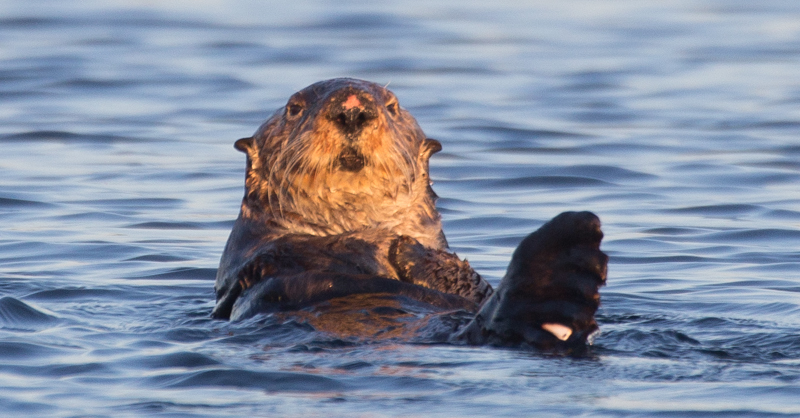 It had to of been done by a male Sea Otter. When the males mate with the females they grab them by the nose so as to make them stay still. There almost always is a struggle & as a result the females nose gets injured. It’ll heal & become pinkish in colour. 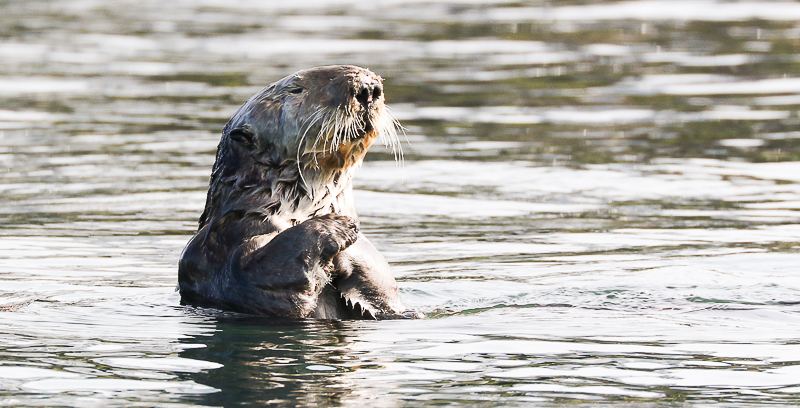 If you see a Otter with a pinkish nose,it’s female. 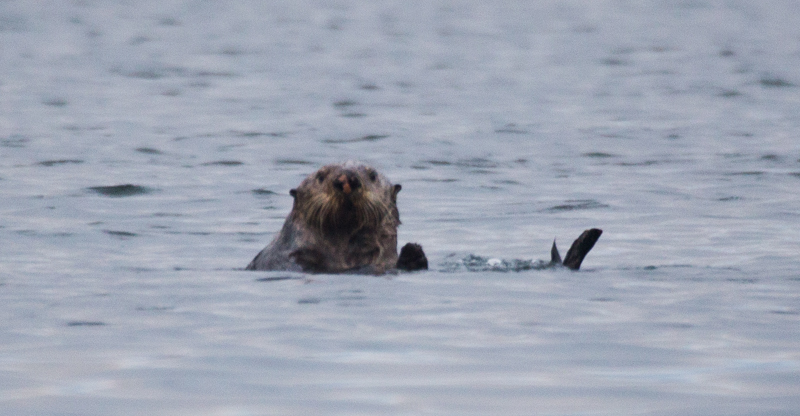 It seems every time I see a Sea Otter,the light is poor! Don’t have good luck with these guys. They normally stay on the outside & I almost always only go on the inside. So I do not run into them very often. I found this female around Strawberry island. & WHO DO WE HAVE HERE? 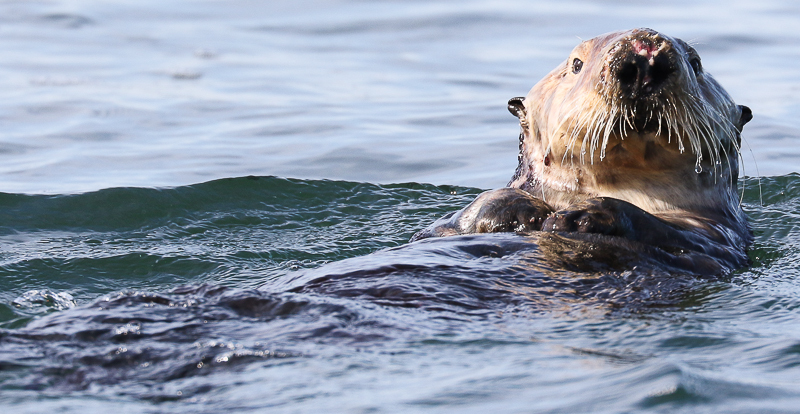 This is a female Sea Otter. How do I know? It has a pink nose. How did it get a pink nose? When the male mates with her,he grabs her nose with his teeth to force her to submit to him. Many times there is a struggle & her nose gets injured. When the nose heals,it has a pink spot to it. See no pink……..it must be a male,or a female that is too young.